​Check out Amazon's Top ​​Rated ​Travel System Strollers! As you probably know, a complete travel system stroller not only includes a stroller, but an infant car seat as well. I know from personal experience that having a baby is well…expensive. Smart parents try to save as much as they can and are always on the lookout for good deals. Psst…manufacturers often offer a better deal on the complete travel system than if you purchase each component individually. I did quite a bit of research before zeroing in on mine – I looked at quite a few different models until I found exactly what I wanted and in the process, I ended up learning a lot about travel system strollers. Below is a list of the 10 best-selling travel systems in the country, along with their distinguishing features, pros and cons. I sincerely hope that other people can benefit from my experience. This premium travel system includes the Bravo LE stroller and a Keyfit 30 Zip infant car seat. So you see, by buying this bundle (and most of the bundles below), you’re actually saving quite a bit of money in doing so! The base for the infant car seat is also part of the package. The stroller seat can be removed within a matter of seconds. This way, it transforms into a stylish frame for the Keyfit car seat, which fits perfectly thanks to an efficient click mechanism. Important: When you buy the bundles, you save money! 1) The stroller has bigger wheels and all-wheel suspension. It can go over moderately bumpy surfaces without losing its composure. The ride is soft and the baby remains comfortable at all times. 2) The stroller can be folded with just one hand. Even better, it’s a standing fold so there’s no need to drag the stroller around or rest it against something as you are attending to other things. 3) Use of high quality materials ensures that the travel system is reliable and safe. Looks quite stylish too! 4) The stroller seat reclines to several positions. Overhead canopy shields against the elements. A large storage basket holds all of the baby’s supplies. 5) The Keyfit car seat is loaded with features like a SuperCinch tightener, one-pull harness, Recline-sure leveling, all weather boot, removable pad etc. This is one of the most highly rated infant car seats out there. 6) Usable right from birth, the travel system is perfect for growing children. 7) Excellent after sales support and lots of happy customers. 1) Does not include child and parent trays or cup holders. However, these are available as optional add-ons. You’ll have to pay extra for them. 2) The price is high. However, thanks to excellent build quality, the travel system ages well and if stored properly, it can be used several years down the line (if you plan to have another baby). 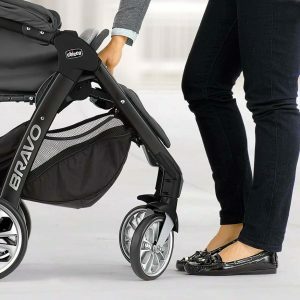 I feel that if budget is not a problem, you should go ahead and get the Chicco Bravo LE travel system. It’s simply the best one out there. Yes, it’s expensive but you do get a lot for your money – including rock solid reliability and complete peace of mind. The first thing that you’ll notice about this travel system stroller is the distinctive wheel set-up. Even though there are four wheels, the front swivel wheels are located very close to each other, giving the impression of a three-wheeled jogging stroller. This type of configuration enhances maneuverability and stability. The carrying capacity of the car seat and the stroller is up to 35 and 55 pounds respectively. 1) The travel system is comprised of the B Agile stroller and the B Safe 35 Elite infant car seat. The car seat base is also included in the box. The two components fit each other flawlessly via a quick click n go mechanism. 2) The B Safe 35 Elite car seat features the exclusive SafeCell Impact Protection system, ensuring maximum safety in the event of a collision. The steel frame adds strength while the specially designed car seat base compresses to absorb the energy of the impact. 3) The sides feature 2 layers of impact protection while the deep contoured shell helps to prevent side-to-side movement. 4) The B Agile Stroller is lightweight and easy to steer thanks to an aluminum frame and front swivel wheels which provide a tight turning radius. 5) Rear wheel foot-activated brake keeps stroller firmly planted in place. 6) The stroller can be folded within mere seconds with just one hand. It stands independently even when folded. 7) The seat features a 5 point safety harness and reclines to multiple positions. Supplies can be stored in the basket underneath the seat. 8) Over-sized canopy protects against harsh sun. 1) Honestly, there are not many flaws in this travel system, although a cup-holder and parent organizer would have been appreciated. International shipping is not available. 2) Car seat gets a little tight for chubby babies. All in all, the Britax 2017 B Agile and B Safe Elite Travel System is a well rounded package. It is sleek, light and very safe – just as a travel stroller should be. This travel system has 3 components: A SafeMax infant car seat, A SafeZone car seat base, and a stroller. The stroller has a carrying capacity of up to 50 pounds while the infant seat can accommodate a baby weighing up to 35 pounds. 1) The Evenflo Pivot Modular Travel system offers multiple modes to meet the needs of growing children. It can be used as a conventional toddler stroller or as a frame stroller with attached infant car seat. Even better, there’s also a third (carriage) mode in which the stroller seat can be tweaked to form a bassinet. Each mode can either have the baby in either the front facing or parent facing position. 2) The SafeMax infant car seat among the first to be rollover tested. It also meets/exceeds all federal crash and structural integrity test standards. The SafeZone base has uses premium materials and an anti-rebound bar to absorb and dissipate the force of impact. The car seat has its own canopy and a soft infant head support. 3) The three panel canopy keeps Sun and wind out. The toddler stroller seat reclines to 3 positions and has a 3/5 point safety harness. There is a roomy safety basket underneath the seat for food, toys and other supplies. 4) Good ergonomics for babies, toddlers and parents. The stroller handle is fairly high – this means that even taller people can push it without having to bend forward. 5) A removable child tray and parent cup holder keeps both child and caregiver happy. 1) The car seat attaches with just one click but bassinet mode is a bit fiddly. Also, it is difficult to steer in this mode. 2) The rear wheels are larger and hence, do a better job over bumps. However, the front wheels are small and get stuck over uneven surfaces. Overall, The EvenFlo Pivot Modular Travel System is perfect for everyday travel – it’s easy to assemble, practical and most importantly, it’s priced right. This is one of the most sought after travel system strollers in the USA. It can be shipped to a few other countries as well. The package includes a three-wheel jogging stroller, a Flex-Lock infant car seat as well as a car seat base. 1) The stroller can accommodate a child weighing 50 pounds or less. Maximum height is 42 inches. The infant car seat is meant for babies weighing between 5 to 30 pounds (up to 30 inches). In short, this travel system is usable right from birth all the way up to 50 pounds. This alone makes it a very smart investment. 2) Most travel systems have puny wheels that start squeaking at the mere mention of a bump. However, this module includes the Baby Trend Expedition Stroller – it has three large, multi-spoke, bicycle-style wheels with air tube tires (12 inch front wheel and 16 inch rear wheels). Basically, the stroller can handle almost any terrain – be it cobbled streets, grass, country trails or even intermittent patches of gravel. 3) The front swivel wheel makes the stroller very easy to maneuver around tight turns. The wheel can be locked for added stability while jogging. 4) The stroller has a multi-position reline seat with 5 point safety harness. Other features include an adjustable Sun canopy, sizable storage area, tether strap (prevents stroller from rolling away), child tray with two cup holders, a parent organizer tray (also with dual cup holders) and a covered storage compartment for change, keys, mobile phones etc. 5) The car seat is equipped with a latch for easy installation. It uses EPS energy-absorbing foam for excellent head protection against side impacts. The seat inserts and pads can be removed for washing. Note: Seat attaches to the stroller only in the parent facing position. Also, do NOT use for jogging with car seat attached. The stroller should be used for jogging only when the child is old enough to sit in the stroller seat. 6) The car seat base has a 4 position push button height adjust mechanism and a level indicator to aid easy installation. 7) Quick, compact fold for easy storage. 1) Since this is a jogging stroller, it is a little heavier and bulkier than a conventional travel stroller. The wheels do come off though, if you want to save some space. 2) Tires require some basic maintenance. The air pressure needs to monitored regularly. Also, you may have to deal with an occasional flat tire. 3) Overall fit and finish can be improved. As usual, Baby Trend impresses with its long list of features and affordable price tag. This travel system jogger is perfect for parents with an inclination towards fitness. This is a luxury travel system that exceeds all federal safety standards. It includes the Britax B Agile stroller, B Safe 35 infant car seat and also the car seat base. The stroller can accommodate up to 55 pounds while the car seat can hold a baby weighing between 4 to 35 pounds and with a seat shoulder height ranging from 6.5 to 11 inches. 1) The B Agile stroller has 4 wheels but in a three-wheeler configuration. This swivel front wheel facilitate easy steering. The stroller is built upon an aluminum frame. It weighs just 18 pounds and is very easy to carry. Hence, it’s perfect for every day travel as well for trips that involve air travel. 2) The stroller folds compactly and easily with just one hand. Click n Go mechanism allows it to transition into a travel system within seconds. 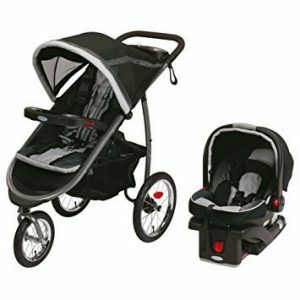 3) The stroller is equipped with lots of convenient features such as a UPF50+ Sun canopy with meshed lining for better ventilation, all wheel suspension for a pliant and comfortable ride, large storage basket, multi-position recline seat with 5 point safety harness and a foot activated linked parking brake. 4) The car seat features Britax’s Safecell Impact Protection system. It has a steel frame and it’s deep design minimizes side to side movement. The foam lined shell shields baby against side impacts. The car seat base compresses to absorb energy in the even of a collision. 5) The car seat base comes with convenient center-pull straps for easy and quick tightening. 1) The car seat is contoured, deep, narrow and compact. While this enhances protection, slightly bigger babies may not like the limited amount of space on offer. 2) The travel system misses out on basic accessories like a child tray, parent cup holders and so on. However, these can be purchased from Britax separately. All-in-all, this is a well engineered travel system. The price is high but so is the quality of materials. Looks sleek and modern too! 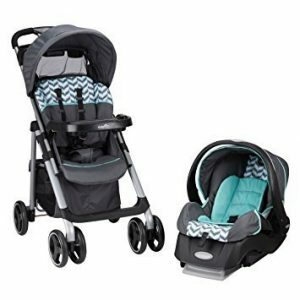 Graco’s travel system is made up of three components – the Graco Fastaction Fold Jogging stroller, Graco Snug Ride Click Connect infant car seat and the car seat base. The stroller can hold a toddler weighing 50 pounds or less while the car seat can accommodate a baby ranging from 4 to 35 pounds and up to 32 inches tall. 1) The three-wheel, all terrain jogging stroller has an 11 inch front swivel-lock wheel and two sixteen inch rear wheels. The wheels have air tires, enabling them to roll over most surfaces without any hiccups. All-wheel suspension ensures that the toddler has a smooth and entertaining ride. 2) The stroller is very easy to steer thanks to an ergonomic handle and the swivel feature on the front wheel, which provides a very small turning radius and comes in handy while navigating busy streets. 3) The travel system is loaded with goodies like removable or swing-away child tray, parent organizer with two cup holders, extra large adjustable sun canopy with peek-a-boo window, convertible 3 or 5 point safety harness, padded seat with multi-position recline and a cavernous storage basket. 4) The best part about this stroller though, is Graco’s signature one-second, one-hand standing fold. The stroller folds so quickly, it seems like it has shape-shifted. It’s quite stunning to look at and practical too! I mean, nobody is looking forward to wrestling with a difficult-to-fold stroller when they’re already preoccupied with a baby. 5) True to it’s name, the Click-Connect mechanism enables the caregiver/parent to connect the car seat to the stroller with just a click. 6) The highly acclaimed Graco Snug Ride infant car seat has an adjustable base that reclines to six positions – making it compatible with the seat of virtually any vehicle. It has a level indicator to easy and proper installation. 7) The car seat meets or exceeds all US safety standards. It features EPS, energy absorbing foam to shield baby from the force of possible impacts. 8) The car seat has a 5 point safety harness, an adjustable Sun canopy and a soft cushion to support baby’s head. The seat cushion is removable for machine-washing. 1) The stroller weighs 30 pounds while the car seat weighs about 15 pounds, including the base. While these numbers are by no means deal breakers, they’re higher than the average for travel strollers. The larger wheels are not exactly airplane friendly although they work just fine for daily travel. 2) Build quality, although acceptable, has a lot of scope for improvement. This travel system builds a strong case for itself. A budget-friendly price tag forms the cherry on the cake. Evenflo’s economical travel system includes a Vive stroller, an Embrace infant car seat and the car seat base. It is suitable for use right from birth all the way up to 5 years. The Embrace seat holds a baby weighing between 4 to 35 pounds while the stroller can hold up to 50 pounds. 1) The stroller has a comfortable seat with multi-position recline and a 5 point safety harness. 2) An adjustable canopy with peek-a-boo window protects baby from the elements and allows the caregiver to keep a close watch. 3) Plenty of features such as a removable child-tray, storage basket, separate storage pouch behind the seat, 2 cup holders, cell phone compartment etc. 4) Stroller has an ultra-slim 16 inch fold. It stores easily in the back of even small cars. 5) EVA wheels with a front shock absorbing system. 6) The Embrace Car seat has been successfully at 2X the US federal safety standards. It has superior structural integrity while also being significantly lighter than other models in its category. 7) The car seat fits securely onto the stroller in a convenient parent facing position. It has an adjustable carry handle, retractable Sun canopy, adjustable safety harness and a soft cushion (removable) to stabilize the infant’s head. The base includes a level indicator to ensure proper recline and installation. The car seat is actually fairly good but some cost-cutting is obvious in the Evenflo stroller. Build quality is pretty average. Also, remember that opening and closing this stroller is a learned skill! 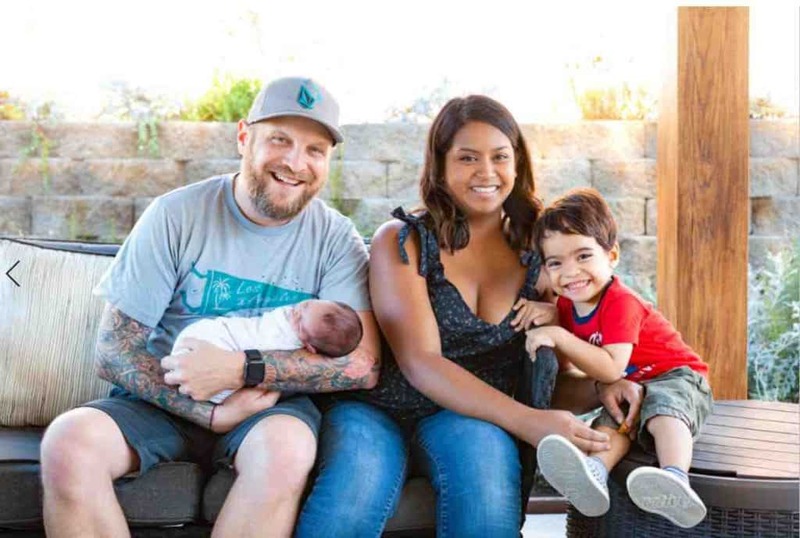 This low-cost travel is made up of a three-wheel stroller, a fixed-back car seat and an EZ flex-loc car base. The stroller can hold a toddler weighing up to 50 pounds while the car seat is usable right from birth up to 30 pounds (minimum weight 5 pounds, maximum height of baby must be less than 30 inches). The seat goes onto the stroller in the parent facing position. 1) The stroller has four wheels in a 3 wheel setup (front two wheels are together). The front wheels swivel and make the stroller easy to control. 2) Both the car seat and the stroller seats have 5 point safety harnesses and adjustable canopies. Stroller canopy has a peek-aboo window. 3) The stroller’s handle can be adjusted according to the height of the parent/caregiver. Parents also get a separate organizer with two cup holders. At the front, there’s a swing away child tray and underneath the seat is a big storage basket for food, toys and other supplies. 4) The stroller folds easily with one hand. 5) The car seat is easy to attach onto both the base and the stroller. It is lined with EPS energy-absorbing foam to protect the baby from the force of impact. A removable head support supports the baby’s head – it can be used both in the stroller and in the car seat. 6) A height adjustable base with level indicator is included in the package. 1) The car seat has a fixed-back. Many parents (and babies) are not fans of the upright position. 2) Overall build quality needs improvement. Although not perfect, the Baby Trend EZ Ride 5 Travel System is a good deal for the money (read – bestseller). It comes with a plethora of well thought-out and useful features for the convenience of both baby and parents. Even though this travel system is last on our list, it is still a highly attractive package with a long list of impressive features, not to mention a pocket-friendly price tag. The system is made up of three modules – a Smooth Ride stroller, an Onboard 35 LT Infant Car Seat as well the car seat base. 1) Usable from birth all the way up to 4-5 years. The stroller has a carrying capacity of 50 pounds and the car seat can hold a baby weighing between 4 to 35 pounds. 2) The stroller has agile wheels for easy maneuverability. Flip-flop friendly brakes keep stroller parked at all times. A large canopy with peek-a-boo window provides shade against the Sun. Parents also get a separate organizer with cup holders and a large storage area underneath the seat. 3) The stroller is ridiculously easy to fold. It folds with just one hand and stands on its own. 4) The infant car seat clicks onto the stroller securely – in the rear facing position. It exceeds all federal and ASTM safety standards and features removable soft inserts to support the baby. 5) Infant car seat features has 4 harness heights to accommodate babies of various sizes. It is light, airplane-ready and provides side-impact protection. 6) Comfortable stroller seat reclines to multiple positions for napping on the go. A child tray makes snacking fun – the parent does not have to bend down with the food in one hand as it goes right in the tray. 1) The car seat base is not exactly user-friendly. 2) Fit and finish needs to be more refined. Safety 1st has done most things right, very few wrong and most importantly, they have priced it right. Hence, their travel system has many takers even in a competitive market like ours. If you’ve made it this far, you probably enjoyed going through the list. Please share your thoughts in the comments section below. I and many other parents are eager to hear from you! Thanks for the review and congrats on the birth of your baby! I’m leaning towards the EvenFlo Pivot Travel System or the Safety 1st Travel System.